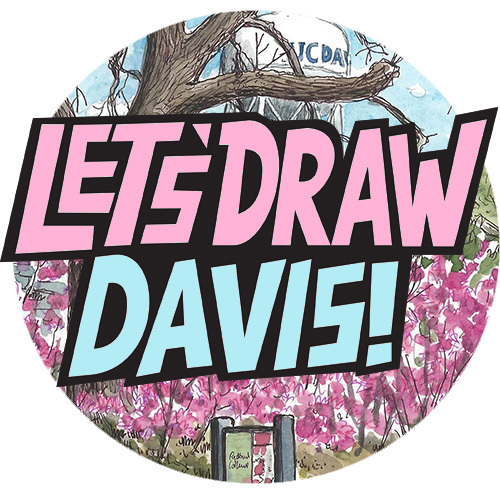 Last Thursday May 16 was the tenth annual “Celebrate Davis” event, held at Community Park, the big park near my house. There were food stands, live music, bouncy castles for kids, a petting zoo, a big zipline was set up, even a dunk tank where kids can throw balls at a button to send some poor volunteer splashing into a vat of water. Mostly there were stands from various different businesses from Davis, this event being organized by the Chamber of Commerce. 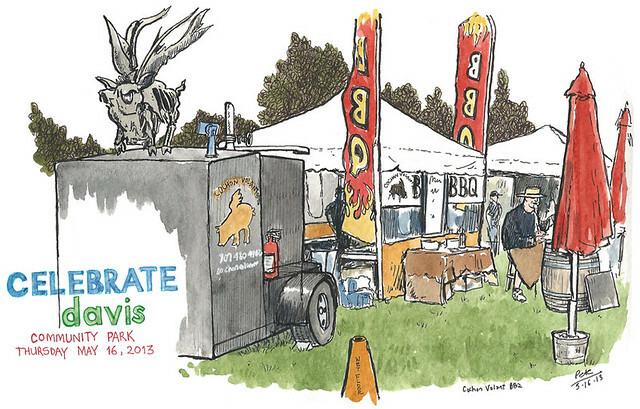 I did a little bit of sketching: above is Cochon Volant BBQ (“Flying Pig”), which I sketched with the smell of grilled pork wafting all around. I don’t eat pork any more but I’m sure it was lovely. 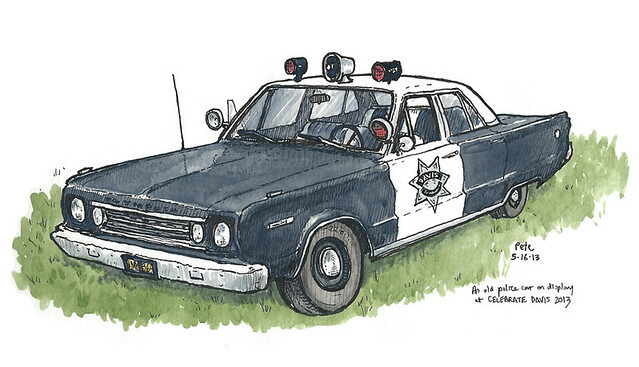 I also sketched an old police car which was parked nearby, the local police were letting kids get in to take photos. This looks very 70s TV cop show to me. I wonder if it ever drove through big piles of boxes on the sidewalk, like they did in the 70s, on cop shows, on TV. Celebrate Davis 2013 ended with its usual spectacular firework display, which thnaks to out location we can see from the comfort of our bedroom window. It’s always nice to see barbecue tents.